The global reputation of the UK’s higher reputation is built upon a long and rich academic excellence of its famous universities. It is known to almost all of us that the University of Oxford is the oldest higher education provider in UK, but did you know that this outstanding temple of knowledge, it is actually the second oldest university that still operates (first is the University of Bologna, by the way). Besides Oxford, there are many other UK universities whose origin dates back around the same time. If this is something you are curious to know we’ve made a list of the oldest universities in UK and a brief overview of their history. The iconic University of Oxford is the oldest university in the history of the UK and the second oldest in the world, second to the University of Bologna (in Italy). There’s not a specific date we would all agree at which this institution was founded. It is, however, widely accepted that the teaching, in one form or another, started at the end of the 11th century (1096 to be more exact). It was the beginning of the 12th century when highly-regarded professionals started teaching at the University of Oxford when the university became a common higher education provider. The university saw a rapid increase in enrollment when Henry II didn’t allow students to go to study in the Univerisity of Paris. 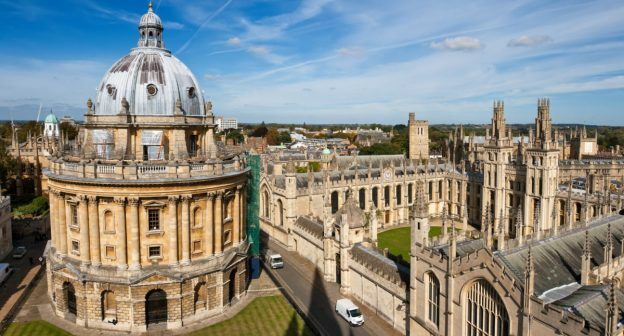 Ever since the University of Oxford has gained a firm global reputation being ranked amongst world’s best universities. Founded in 1209 by a group of Oxford who students who left the town after a clash with local residents, the University of Cambridge is the second oldest university in the UK. As a result of this these two universities continue to share several common features and in regard of these are referred to as Oxbridge. At the present time, the University of Cambridge is acclaimed to be amongst the UK and world’s best universities valued for a top-quality education. Cambridge is definitely more than a university, but a large research and teaching center constituted from 31 colleges and six schools divided into over than 100 departments. The University of St Andrews is the oldest University in Scotland and the third oldest university in the entire UK. Its official foundation takes us back in 1413 when Scottish students had difficulties to seek previously traditional routes of higher education like universities in England and Paris after the church was divided between two rival popes. In that tough situation, the only way out was seen the establishment of a new home school for higher studies and St Andrews was obviously the perfect place. By that time the town of St Andrews was the biggest bishopric in Scotland and its monastery was already known as a center for learning. The University of St Andrews went through a challenging history, especially in the first years of their existence, but eventually, it survived and today sits alongside best and most reputed universities in UK. The famous University of Glasgow is the second-oldest university in UK and the fourth oldest in the entire UK. In 1451 the Pope Nicholas V with the suggestion of King James II gave the permission to a St Andrews graduate to open a university near the city’s cathedral. During its long history the University has established a firm reputation and today it stands in the list of the best UK universities. The University of Glasgow prides its community of alumni, which includes famous and renowned personalities like three British Prime ministers, James Watt, Lord Kelvin, Adam Smith to mention a few. The foundation of the University of Aberdeen has its roots in the medieval times. In 1495, the Bishop and the Chancellor of Scotland opened a college to train young people for serving the Scottish Crown. The King’s College trained doctors, lawyers and administrators. In 1860 this college united with the Marischal College to form the University of Aberdeen. In 1852, the Edinburgh Town Council brought to life a college of law which later established as a formal college in 1853 from the Royal Charter. Ever since the university became an essential part of the academic and politic life in Scotland and in UK. In the early days, the University benefited from the legacy of graduates from other Scottish universities. The University of Edinburgh had an essential role in the Enlightenment Age as one of the ancient’s universities in Scotland. In its long and rich history the University of Edinburgh has raised to become one of the best universities in the UK. Not only that because the university of Edinburgh is ranked among the world’s top universities. The University of Manchester, in the way we know it today was created in 2004, but its roots took us back in the 19th century. In 1824 the chemist John Dalton with the help of local businessmen and industrialists established the Mechanics’ Insitute. This institute was created to help young people learn science principles at the time when industry was flourishing in that area. In 2004, the University of Manchester Institute of Science and Technology united with the Victoria University of Manchester. The University College London was the first one established in the city of London and it comes eighth in the list of the oldest universities in UK. It was founded in 1826 by a group of visionary people who dreamed to build a secular university where students will be admitted regardless of their religion as it was the case with other universities in UK. Also, the university was the first one to admit female candidates under the same conditions. Today, the UCL is among the top five best universities in London as it is regularly ranked in top universities in the world. The University of Durham was established in 1832 by an Act of Parliament at a time when North England was undergoing a blossom of thought and culture. However, the history of this university extends to hundreds of years before its official recognition as a higher education institution. In 1286 the University of Oxford had a specific student hall for monks of Durham. Years later in 1380, several monks founded the Durham College, Oxford which remained a dependent college until its official establishment in 1832. The Durham University was among the first to admit women on equal terms, among first to had a medical center and the first to have awarded a degree in Civil and Mining Engineering. Even in the present times, this university ranks as one the leading higher education center in England and UK. In beginning, the building of Aberystwyth University was intended to be a grand railway hotel but soon the history got a turn. In 1872, its owner bankrupted and the University Committee of Wales purchased it to establish the University of Aberystwyth. In its first year of existence, the university counted 26 students and three teaching staff and the enrollment grew up in the upcoming years. In 1884 there was an explosion in one of its laboratories but eventually, the university survived to become a landmark in the Welsh higher education.